Dr. Tekalign Ayalew Mengiste obtained his PhD in Social Anthropology from Stockholm University, Sweden in 2017. 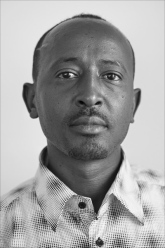 Currently he is senior researcher in the College of Social Sciences at Addis Ababa University and affiliated researcher at the Department of Social Anthropology, Stockholm University. His research interests include refugee mobility, diaspora, migration industry, transnationalism, human smuggling, youth, health & wellbeing. His PhD dissertation entitled “Struggle for Mobility: Risk, hope and community of knowledge in Eritrean and Ethiopian migration pathways towards Sweden” has won Högskoleföreningen’s prize award for outstanding scientific achievement in dissertation work. He has fieldwork experiences in the Horn of Africa, the Sudan, Italy, Sweden and the UK. Dr. Tekalign has also won grants and has been engaged in and managed several research projects such as “Understanding migration industry in Ethiopia”, funded by DFID and OSSREA (2018); the EU Marie Curie grant on “Diasporic Construction of Home and Belonging” (CoHaB) (2012-2016); “Customary Dispute Resolution Mechanisms in Ethiopia”, funded by EACC (2010-2011); “Civil society organizations and disabilities in Ethiopia”, DFID (2011-2012) and “Gender Inequalities, Power Relations and HIV Aids in Sub-Saharan Africa”, funded by OSSREA (2009). Dr. Tekalign’s current research focuses on the role of migration industry in organizing migratory departures from Ethiopia and in cross border mobility. Using the practice of brokering as a central point, the study examines the socio-political and economic logics that shape the engagement of government and nongovernment agencies such as brokers in planning, promoting and organizing the migration processes. More specifically it aims at exploring how micro- and meso-level choices and decisions at origin, in transit, or at staging posts during step migration, are shaped by policy, political conflict, legal status, economic circumstances and social/cultural factors. The current ‘migration and refugee crisis’ across the Mediterranean region, particularly as represented via images of human suffering and African migrants’ boat tragedies, has attracted media, public, academic and political attention. However, less is known about the conditions that shape overland migration from the Horn of Africa and migrants’ experiences before, during and after they arrive in northern European destinations. Long journeys across countries in political crises (for instance Libya), vast deserts and high seas are dangerous and fatal. But migrants’ vulnerability levels vary according to individual profile: age, gender, religion and access to finance – in the diaspora or countries of origin – needed in case of kidnapping for ransom or imprisonment en route. Based on ethnographic fieldwork conducted in Sweden, Italy, Sudan and Ethiopia, 2013-2015, this study examines migrants’ subjective energy and collective practices in producing and appropriating networks and infrastructures that help them survive vulnerability and stepwise journeys, despite Europe’s creation and fortification of internal and external borders. Ethnographic accounts reveal complex factors and dynamic conditions behind the journey and its impacts. This dissertation depicts how Ethiopian and Eritrean migrants and refugees negotiate and navigate impeding and facilitating institutions and actors while organizing various stages of their mobility: departures from homelands, transit across the Sudan, Sahara desert, Libya, Italy and arrival and homemaking in Sweden. I attempt to explore community, historical and cultural dimensions and social forms of organizing ‘irregular migration’ and practices of human smuggling. Tekalign Ayalew. Refugee Protections from Below: Smuggling in the Eritrea-Ethiopia context. The ANNALS the American Academy of Political and Social Science (AAPSS), 676(1): 57-76. Tekalign Ayalew. The Emerging Risks and Developmental Challenges to Children and youth in Ethiopia: The Case of Arba Minch Town. Ethiopian Journal of Social Sciences and Humanities, 8(2): 47-74. Tekalign Ayalew (in press). “En Route to Exile: Gendered Transition Experiences of Ethiopian and Eritrean Migrants in Sudan.” In a volume edited by Sadia Hassanen and Charles Westin, Trenton: The Red Sea Press Inc.
Tekalign Ayalew. “Ethiopian Diasporic Community Networks and Practice of Homemaking in Sweden”. In Emma Patchett and Sarah Keenan (eds), Spatial Justice and Diaspora, pp: 144-164, Oxford: Counterpress. Ayalew Gebre, Tekalign Ayalew & Helmut Kloos. “Gender Inequalities, Power Relations and HIV AIDS: Exploring the Interface in Sub Saharan Africa.” In Getenet Tadele & Helmut Kloos (eds), Vulnerabilities, Impacts, and Responses to HIV/AIDS in Sub-Saharan Africa, New York: Palgrave Macmillan. Tekalign Ayalew. Struggle for Mobility: Risk, Hope and Community of Knowledge in Eritrean and Ethiopian Migration Pathways towards Sweden (PhD diss.). Tekalign Ayalew. Risks, Resilience and Adaptations in Child Life: Success Stories of Resilient Children and Youths in Arba Minch Town of Southern Ethiopia, VDM Verlag. Tekalign Ayalew. Smuggling Horn of African migrants through Libya: processes, practices and impacts. When Smuggling Goes Wrong: Empirical advances on smuggling research. UNODC Human Trafficking and Migrant Smuggling Unit, Vienna. Tekalign Ayalew. The Struggle of Mobility: Organizing High-risk Migration from the Horn of Africa. Open Democracy. April 8. School of Oriental and African Studies (SOAS), University of London, autumn. Immigrant Transnationalism And Movement Across Closed Borders: Ethio-Eritreans Transnational Journey To Sweden. Paper presented at Transnational Migration: Disciplinary Impacts. Organized by IMISCOE Research Group, Transmig-Transnational Practices in Migration At MIM, Malmö University, Sweden, January 29-30. The Summer School was hosted by Dr. Parvathi Raman and the SOAS Centre for Migration and Diaspora Studies. It explored how ideas of diaspora, and migration have travelled, cross-fertilized, and re-emerged across disciplines. The program included keynote speeches by experts in the field, as well as panels on gendering diasporas, law and labour migration, poetry and creative writing in diaspora studies, inter/trans-disciplinary studies and migrant activism. Speakers, panelists and performers included: Prof. Nira Yuval-Davis (UEL), Prof. Janet Wilson (University of Northampton), Dr. Shahram Khosravi (Stockholm University), Prof. Saskia Sassen (Columbia University); Professor Avtar Brah (Birbeck University of London), and Fortune Theatre Group among others, London, UK, April 9-15. Movement Across Closed Borders: Narratives of Ethiop-Eritrean Migrants’ Transnational Journey to Sweden. Paper presented at the Nordic Africa Days 2014: Misbehaving States and Behaving Citizens? Questions of Governance in African States. Organized by the Nordic Africa Institute, Panel 26, Uppsala, Sweden, September 26-27. 'Making’ Movement Across Closed Borders: Ethio-Eritreans' Transnational Migration to Sweden, CEIFO seminar paper, Department of Social Anthropology, Stockholm University, March 3.